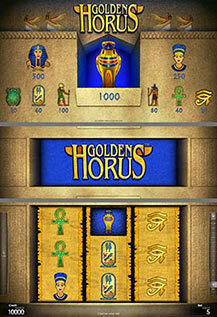 Discover the ancient mystic Egypt by participating in the exciting adventure of „Golden Horus™“. This 5-line and 3-reel game can lead you to the big Pharaoh’s treasure. Search for the Golden Horus and become immortal. All prizes are for combinations of the same kind and are paid for combinations from left to right.